The Donut Girls provide an unforgettable experience with warm, fluffy mini donuts to be prepared and served at your next wedding, corporate event, carnival, birthday party - you name it! Because when are fresh donuts not a good idea? Most orders are confirmed within an hour. Since our new menu options are constantly changing, we will send you our current offering once we receive your inquiry. 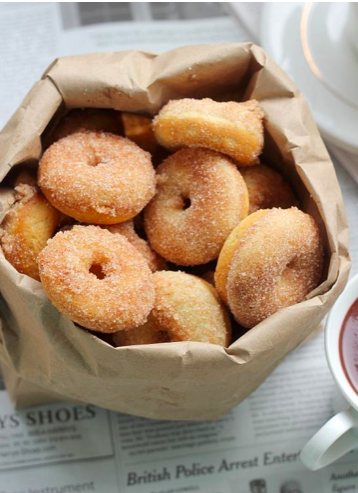 Bring delicious, fresh, made-to-order mini donuts to Ventura County because let’s be honest . . . who doesn’t love a good donut? There is not a single situation in life in which eating a donut would not make the moment THAT much better. In addition, with our experience we allow your guests to experience the donut from start to finish. From the first drop of dough to the warm, sugary, finished product, they will see the process in it's entirety! 50% non-refundable deposit is required on all packages to save your date. The Donut Girls arrive on-site (1) hour prior to serving time to set-up + pre-cook donuts at no additional charge. Table (6’ minimum) must be set-up + provided by client. Special Events (estimate will be provided) Having an event that doesn't fit into one of the packages above? Send us an e-mail and we would be more than happy to build a custom package for you! our Traditional and most popular topping for on site events is CINNAMON + SUGAR but we can explore others. Please contact us to discuss. Hello, we are Kaitlin and Sara! Were lifelong friends thaT attended a family wedding that had a mini donut dessert experience. We stood in line 3X scarfing down the donuts and even eating leftover bags off tables at the end of the night. That is when the idea OCCURRED to us: what if we brought this concept to ventura? The city we live in and love! Thus our side HUSTLE was born and we have never looked back since! We love making hot, delicious, melt in your mouth mini donuts, even more than that we love working with all of you to make your events even more special! We are accommodating, easy to work with, always on time, clean and friendly. We Can't wait to be a part of your special day! Whether your hosting an informal gathering, or that once in a lifetime moment, we look forward to catering your next event. Please fill out the form below and we will promptly get back to you to sort out the details! All images and materials are copyright protected and are the property of The Donut Girls. Please contact us for permissions. © THE DONUT GIRLS, 2018.